The printer staying level while the ship rolls around it. This passive compensation system seems to be working the best so far. Image courtesy of the NOAA Office of Ocean Exploration and Research, Mapping Deepwater Areas in the Caribbean and South Atlantic Bight. Download larger version (jpg, 4.1 MB). Hello all! My name is Sean Nagle, and I am the final member of the University of Rhode Island (URI) group researching 3D printing. Like my other team members, I am also a senior in Ocean Engineering. 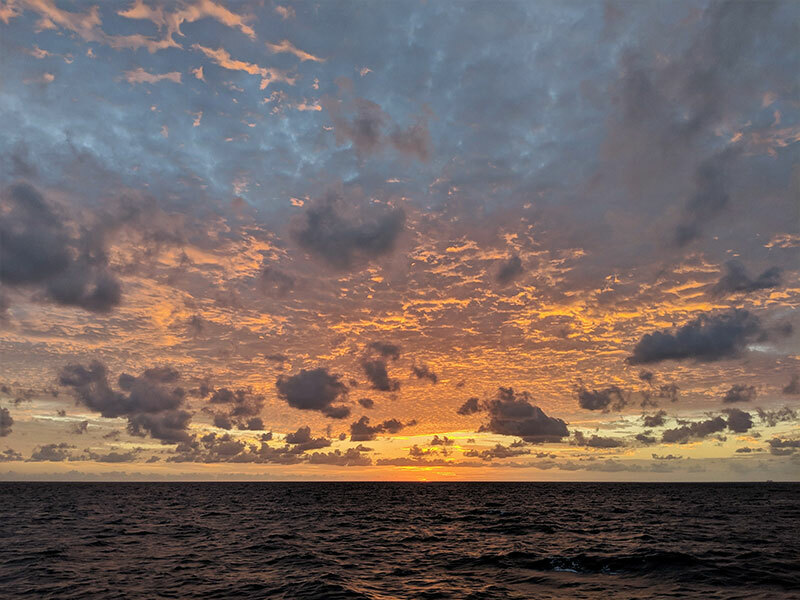 Today was our final day on board the Okeanos Explorer, and it while it seems like it’s been long, it has also been exciting. Since we switched from active compensation to a passive system, the printer has been staying so level that we’ve been able to leave it mostly unattended while printing. I started my day around 2 am this morning, as that was when the printer finished printing the set of pressure housings that we were going to test today. Because we have such limited time on board, we pretty much sleep at the whim of the printer! In this case, I needed to remove the housing, start the next print, and then thoroughly clean the newly finished print. Once that was done, I was able to get a few hours of sleep before breakfast. At 2:17 in the morning, waiting for the last minute of the print so the next one can begin. 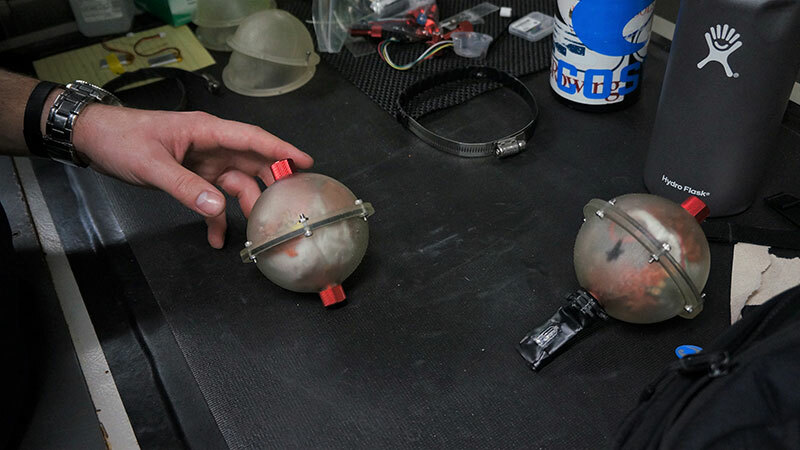 This was the two halves of the pressure housing that was tested at depth today. Image courtesy of the NOAA Office of Ocean Exploration and Research, Mapping Deepwater Areas in the Caribbean and South Atlantic Bight. Download larger version (jpg, 5.6 MB). The CTD with attached housings and camera being lowered over the side to test the 3D printed pressure housings. Image courtesy of the NOAA Office of Ocean Exploration and Research, Mapping Deepwater Areas in the Caribbean and South Atlantic Bight. Download map (jpg, 5.5 MB). Later in the morning, we had our main event for the day, which was pressure testing the housings we had printed in the ocean. 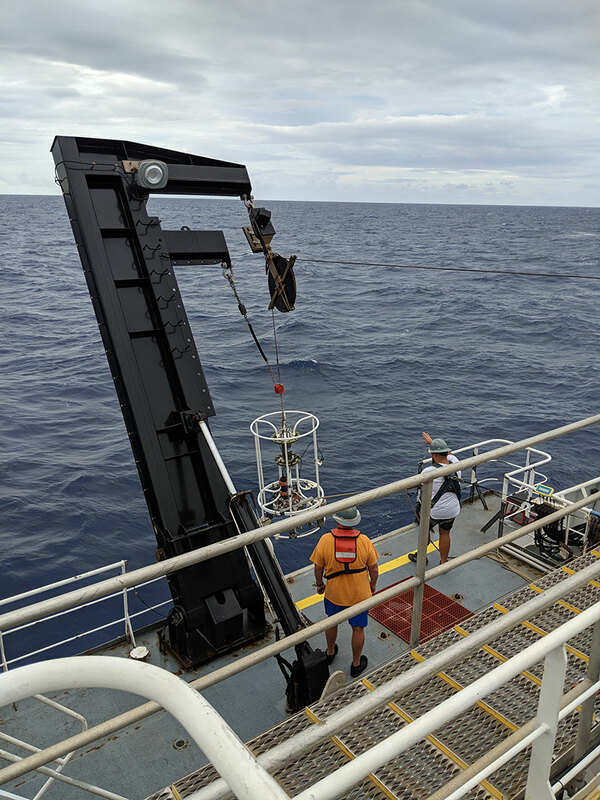 The ship is equipped with a CTD (Conductivity/Temperature/Depth), which is an instrument that travels through the water column to collect data. We were able to attach two of the pressure housings we had made (one of them printed on board) to see if they would hold up to our calculations (estimated failure at 310 meters). The CTD was sent to 200 meters depth, then retrieved. I was apprehensive while waiting for some of my teammates to bring the housings back into the lab, but I’m happy to report that both of the housings stayed watertight! 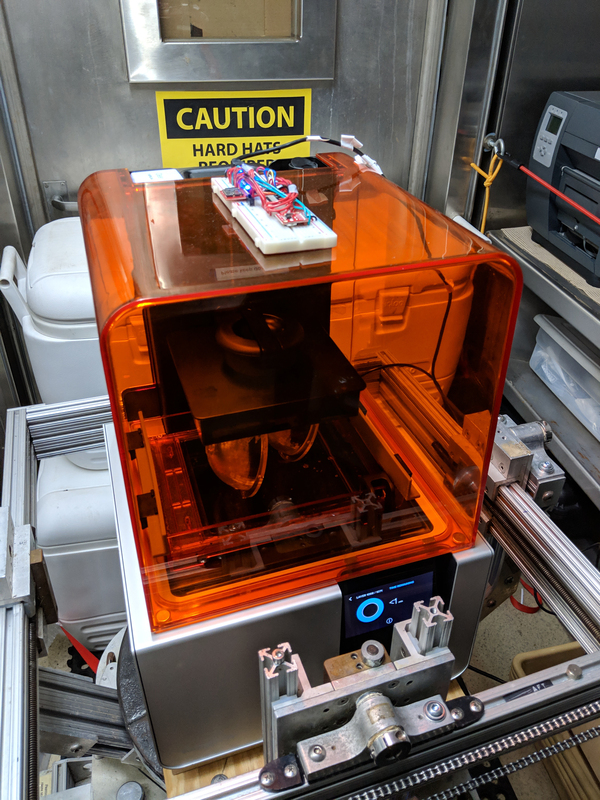 As a proof of concept, this is a great success; we 3D printed a pressure housing on board a research vessel while under way, using a type of printer that had never been brought to sea before. When we started this project in September, I don’t think any of us would have believed it if someone told us that this is what we would have accomplished by December. 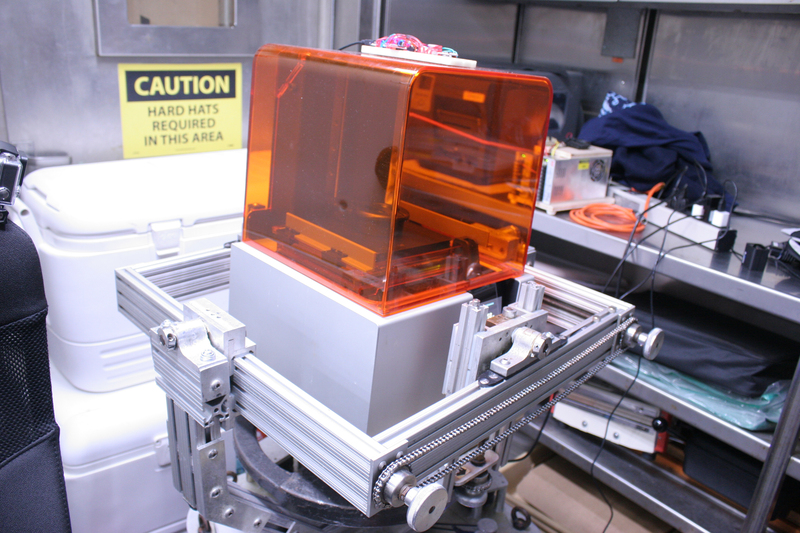 Preparing to open the pressure housings after the test – it looks like the circuits inside are still blinking! Image courtesy of the NOAA Office of Ocean Exploration and Research, Mapping Deepwater Areas in the Caribbean and South Atlantic Bight. Download larger version (jpg, 2.4 MB). The rest of the day was a little bit closer to what we’ve come to see as normal on board. We cleaned and cured the print I started early this morning, another set of pressure housings that we’ll test when we get back to URI, and started one final print. Once that finished, we enjoyed our final sunset on board and the team started packing all our gear back up for shipping. Tomorrow will be another early start, as we’ll be taking a small boat to the Bahamas to fly back home. I think I speak for the team when I say that we’ve learned and accomplished more than we ever could have hoped for on this trip, and that we’re excited to start applying what we’ve learned the minute we get back. Looking out at the final sunset on board from the bow of the ship. Image courtesy of the NOAA Office of Ocean Exploration and Research, Mapping Deepwater Areas in the Caribbean and South Atlantic Bight. Download larger version (jpg, 4.1 MB).